Far up in the northwest corner of China's Yunnan Province, just off the edge of the Tibetan Plateau, lies the Lijiang Plain. It is home to the Naxi people, one of the best known of Yunnan's two dozen national minorities, a folk whose art and music are drawing appreciative students and patrons from distant lands. And their attention, in turn, has encouraged the blossoming of a neo-traditional renaissance in the work of local painters and musicians. For hundreds of miles in any direction there is no setting more conducive to the creative spirit than Lijiang County. It comprises a broad plain between two stretches of the Upper Yangzi River, which runs north to its east, then bends sharply south 100km north of Lijiang, turning north again at Shigu, just southwest of here. High mountains bound it on all sides, the predominant being Jade Dragon Snow Mountain, 5596 meters tall, its ever-iced peak visible from a point half the distance from Dali, beckoning the traveler northward. Once crossing the pass, the willow-lined highway winds down onto the Lijiang plain. Sturdy stone houses, with whitewashed walls and tile roofs with upturned corners, stand off either side of the road. Stocky women in Mao caps, trousers and black and white sheepskin capes tend the gardens in front. The road terminates at Lijiang, which is really two cities in one, divided by a pine-forested hillock. On one side there's a new town, forty years old, of administrative and commercial buildings, where Han and Naxi residents mix with colorful Yi, Tibetan and Bai shoppers from distant mountain villages: on the other side lie the old quarters of Dayan--the hub of Naxi culture. This remarkable warren of stone streets, flanked by swift, clean canals, stone and wood shophouses and walled compounds, has kept its basic layout, character and population level (50,000) intact for over 800 years. It is a town where folks keep potted flowers and caged birds on their balconies, where nobody starts work very early and the gurgles of the streams and the warbles of the songbirds dominate the morning sound waves. And the men? Well, they do look after the children and the home gardens, keeping the fruit trees in their courtyards trimmed, watering the potted orchids, geraniums and azaleas. They also raise and groom the horses, for which Lijiang was famous in centuries past. The city still hosts semi-annual horse fairs, a throwback to the time when Lijiang, originally known as the Piebald Horse State, was an important post on the caravan routes. But the men's cultural role has been more directed towards things of the spirit--religion and the arts. And their achievements have endured centuries of isolation as well as the wars and revolutions of recent history. Nowadays legions of visitors, Chinese and foreigner alike, come to marvel at the city's architectural embellishments, praise the paintings of its artists and listen to the lilting music of its orchestras. Traditional Naxi art derived from the ethos of its unique religion, known by the name Dongba. At first glance it appears to be a mixture of Tibetan Lamaism and Chinese Daoism. Besides Dayan, the first things a traveler wants to see are the Ming Dynasty temples and halls, such as the complex around Black Dragon Pool, a photogenic park just north of Lijiang. Their carved eaves, painted woodwork, well-tended gardens and compound walls, while attractive, are not substantially different from Daoist temples elsewhere in Yunnan. Even their gods, such as the pre-eminent one in the Naxi pantheon--Sanduo the War God, replicate Daoist deities. The frescoes, such as at Baisha, depict themes and gods from Daoist tradition. Yet there are also lamaseries in the foothills around the valley, which were full of monks and every bit as active as in Tibet until 1949. One of them, Wenfengsi, high up a steep, pointed mountain 10 km south of Lijiang, was a center for ascetic practices. Initiates were literally 'holed up' in a pit by a stream in the nearby forest, to stay for three years, three months, three days and three hours, reciting sutras, meditating and battling the demons of the mind. At the end of this ordeal they were supposed to be endowed with enough spiritual power to enable them to levitate. Nowadays the site is a popular picnic ground and the only regular residents at the temple compound are two septuagenarian caretaker lamas, precisely the situation at the other main lamaseries, though Wenfengsi is also sometimes home to Lijiang's sole reincarnated lama, the 'Living Buddha' Denjing Congji Jacou, trained in Lhasa. At the heart of Naxi religion, however, is the character of the Dongba. He combines the role of tribal shaman and Brahmin pandit. He chants scriptures at weddings, New Year rites and, especially, funerals, where his recitation is designed to expiate the sins of the deceased. He learned his trade from his grandfather or uncle and receives neither compensation nor social privileges for his efforts. His training consists mainly in learning to read and memorize the Dongba scriptures. The scriptures are contained in old manuscripts written in a peculiar hieroglyphic script unique to the Naxis. This Dongba script combines pictures with symbols to represent both words and sounds or grammatical elements. The system abbreviates somewhat, not being as sophisticated as the ancient Egyptian. Manuscripts are not very long. They usually narrate a didactic tale or Naxi myth--'something that makes you think,' as my Naxi friend put it. There are no Dongba temples, no leaders, no hierarchy. Its tenets have never been systematized and the vast corpus of Dongba literature--some 20,000 manuscripts--has not been properly translated and collated. Yet Dongba philosophy has a distinct aesthetic attitude, one which Naxi artists have followed down through time. In painting, the gods must look benevolent, the demons grisly and all figures fresh and vibrant. In dance, the choreography must be a dramatic imitation of the physical movements of birds and animals. In music, the tunes should be melancholic or sad, the arrangements a steady progression of regularly intermittent rhythm changes. Naxi music originated with the Mongol conquest of Yunnan in the 13th century. Naxis made hide rafts to aid Kublai Khan's crossing of the Yangzi and in gratitude the emperor left behind a band and many music compositions, of which twenty-two have survived. Orchestras comprise twelve to twenty-four members, playing instruments common to classical Chinese music--2-, 3-, and 4-stringed instruments played with plectrum or bow, flutes, drums, gongs. 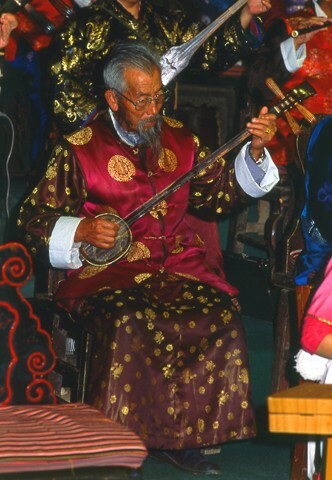 The Naxis have added the sugudu--a 4-stringed Mongolian lute--and their own small, high-pitched flute called the bobo, fashioned from the wingbone of a wild goose. For eight centuries men kept this music alive, but when the Communists marched into Lijiang's life such music was discouraged in favor of the military marches and heroic operas that celebrated the Revolution. Some Naxis welcomed the Red Army. Naxis had helped Ho Lung's army cross the Yangzi at Shigu during the Long March and many were eager to transform society along the lines of the new ideals. But recalcitrant orchestra leaders were jailed during the Anti-Rightist campaign and the whole of Naxi tradition came under vicious attack as 'superstition' during the heyday of the Red Guards. Temples were damaged, artworks and old manuscripts destroyed, Dongba music banned and painters conscripted into the school of socialist realism. When the dust had settled politics in Lijiang made a U-turn. Naxi leaders decided that their tradition was indeed well worth preserving. Musicians were released from jail and painters permitted to experiment and create new styles. The small museum set up in 1954 was expanded into the Dongba Cultural Institute. It set its immediate task as collecting the old manuscripts. Some 5000 of these are now housed at the institute, which has published three volumes with modern Naxi and Chinese translations. More generally, ethnic expression was encouraged and funds were allocated to patronize the traditional festivals. Public celebration of Sanduo's holiday now outdraws Learn from Lei Feng Day. Encouraged by the new atmosphere, musicians resumed performing. But there were few of them left and most, like the surviving lamas, were getting very old. And not all the tunes were known by all the players. But when Lijiang was opened for tourists a new audience was at hand. The surviving orchestras were called upon for more performances and their success led to the formation of new groups in the villages. Sons and nephews began taking up the instruments and while among Lijiang's dozen orchestras of 300-odd players grandfathers make up the bulk of the band, there is an encouraging percentage of young musicians. National recognition has come, too, for Chinese state television has done features on Naxi music in both Chinese and English. Dayan's own orchestra enjoys the highest reputation. Its conductor currently is Xuan Ke, who spent 21 years in jail as an unreconstructed 'rightist': maintaining, among other heresies, that the origin of music was fear (of the elements) and not, as the Party would have it, work songs. In presenting Naxi music to his foreign audience, Xuan Ke elucidates the Daoist principles underlying the compositions and asks us not to listen to, but instead to receive the music. The reception points are: the inside corner of the left eyebrow, the point in each hand where the index finger touches when the hand is clenched into a fist, the spot three finger-widths below the navel, and a point two and one half finger-widths below the soles of the feet. Daoist philosophy permeates Naxi music and in the old days performances lasted three days and two nights, with long Daoist recitations between tunes. Nowadays the recitations are omitted, but a show still opens with "The Eight Trigrams," a piece which welcomes the gods, and closes with "Old Man by a Stream," which bids the deities goodbye. Naxis themselves hire orchestras to play at weddings or clan feasts. Sometimes they perform in their own villages for free on holidays or festivals. The band might very well expand on such occasions. The performance will be preceded by speeches and attended by all the village womenfolk in their best traditional garb. They'll start off with a ring dance and some lively folk songs and then feast while the orchestra plays. When the performers retire for their own meal their audience returns to the courtyard for some hand-in-hand, energetic, post-prandial dancing, to the taped sound of Yi flute music. In this context, performers and audience are all of the same community and Dongba music is the bond of social life. In contrast to the atavistic role of the musician, that of the painter in today's Lijiang is to push Dongba art in exciting new directions. Until 1979 Lijiang's artists were expected to pursue one of two main styles--realistic portraiture or Han-style landscape painting. With the new economic policies of that time came reforms in the official attitude towards art. As a result, a new Yunnan School emerged, characterized by a bold use of strong colors and a reliance on ethnic backgrounds, of which there is an abundance in the province, for thematic inspiration. In Lijiang this meant a return to the Dongba scriptures for both themes and pictorial styles. The new painting is best exemplified by the works of Mu Jixin and two of his students--Xu Zhengzhang and Zhang Yunling. Zhang has exhibited in France and South Korea. His figures are simplified, done with bamboo brush, recapturing the sweep and motion of the hieroglyphics. Eyes stand out from the heads on stick-figure humans. He has a spare use of line and a good sense of space. But his paintings are purely descriptive, depicting various aspects of traditional Naxi life--hunting, herding, capturing a tiger, planting and reaping, courting--without the mythology of Xu's or the profundity of Mu's. Xu's figures dance, gravity-free, across the canvas, lines merging into teardrop corners like those in the Dongba manuscripts. While attending Yunnan Art College in Kunming, 1981-85, Xu abandoned peasant portraits and misty landscapes and began recreating the pictures in the scriptures. Upon returning to Lijiang he studied the ancient script with an old master for two years, believing that only by thoroughly understanding Dongba symbolism could he present it in his art. Able to read the manuscripts, he culled them for themes for his subject matter. He has depicted the First Naxi, the Original Dongbas, the place where romantic suicides go after death, Sanduo in full armor and various Tibetan guardian deities and Garudas that replicate 15th century thangkas. Most of Xu's work is done on paper, with about a month required per work. Oil paintings he does less often, needing over three months per piece. His wife also paints, in a somewhat different style, though she too draws on traditional Naxi motifs and her aim is likewise not representation but vivid interpretation. Samples of their work hang in the Piebald Horse, along with those of less prolific but comparably talented Lijiang painters. According to Lijiang folks, the real master is Mu Jixin, who has a different view of what a painting should be. His own teacher was Jiang Tiefang, who, together with Ding Shaoguan, founded the Yunnan School of Painting in the early '80's. Mu was first of all a Han-style painter, reproducing Tang works and doing fine landscapes in ink. He was employed by the government to reproduce the Ming Dynasty murals at Baisha village, as well as the Dongba fresco in the Naxi theme park near Kunming, with its army of pictographs marching along the wall. But recently he came to regard the Han style as too constricting and started combining Han themes, such as poems by Wang Wei, Li Bai and Du Fu, with Dongba-style illustrations. He inks the poem at top right, with the theme done in Dongba pictographs with classical Han settings. Colors are few and muted. His latest works are more ambitious, suggestive of Miro and Chagall, using a strong color background and a few pictographs that symbolize a tenet of Dongba philosophy. And while other painters quibble over prices, Mu is more concerned that the client appreciates the meaning of his painting. If the client fails to get it, Mu simply won't sell the painting. Having observed the success of these painters, younger Naxi artists are turning to the Donga style and painting pictographs on banners, burlap, and even souvenir shoulder bags. Woodcarvers inscribe them into plaques. And now carpet weavers are producing woolen carpets with designs lifted from, or inspired by, old Dongba manuscripts. The steady stream of tourists has created a new market for a whole range of local arts and crafts, and Naxi artisans have been quick with the supply. Lijiang gets its share of Yunnan's tourists but the city is hardly overrun with them. Perhaps a maximum of only forty or fifty foreigners a day prowl its streets and bike out to its villages. But the city will have an airport by the end of 1994 and is braced for a thickening flow of tourists. Motorcycle taxis have recently started operating and soon there will be more camera-toting white folks in the market than Yis and Tibetans. One can't help but wonder how this will affect this conservative Naxi culture, its art and its music. Well, there is cause for optimism. Building laws have been enacted to keep the old town of Dayan intact. The steady trickle of foreigners who have come have left no doubt about their high regard for the town, its people and its arts. This has coincided with Lijiang's neo-traditional renaissance and has grounded its artists and performers in self-confidence. Growing appreciation has given them faith in their artistic choices and they are unlikely to fall for any 'commercialization' of their talents. So long as the night skies brightly twinkle, the snow on Jade Dragon Mountain stays white, the blossoms return to the cherry trees and the parakeets chirp along the canals, Lijiang's distinctive art and music will endure. And one day their reputation will reach towns in this wide world as remote as their own bailiwick.